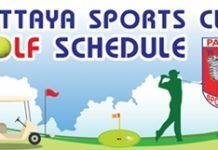 Organized by the oldest rock ‘n’ roll bar in town, the Tahitian Queen, and ably assisted by The Golf Club on Soi LK Metro, the 22nd annual T.Q. 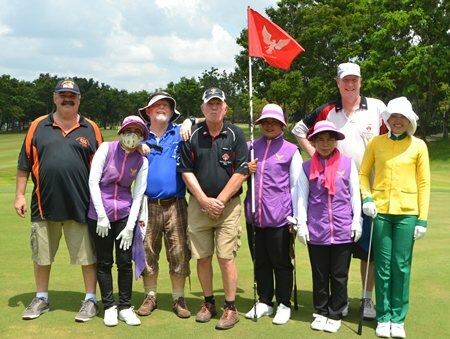 Masters golf tournament took place on Friday, October 16 at Phoenix Gold Golf & Country Club in Pattaya. 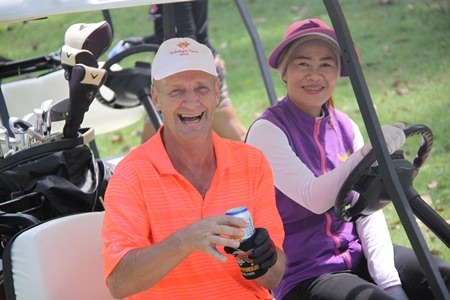 The change of venue for this year’s event from Emerald Golf Club meant a much shorter ride out (and back) for the 68 players who took part and was appreciated by all. The tournament was played in a stableford format off the white tees on the Ocean & Mountain courses, with three flights and multiple technical prizes to shoot for. 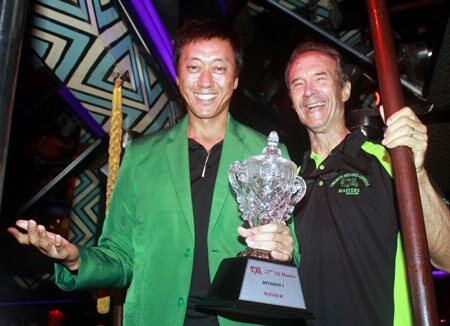 There was also the small matter of the battle for the coveted green jacket and title of overall champion for 2015. 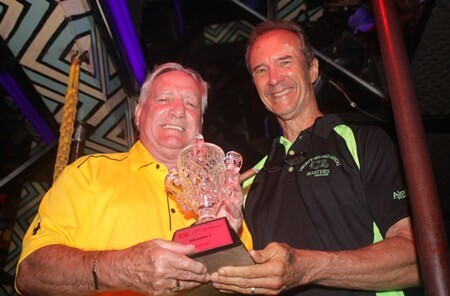 2015 TQ Masters champion Gene Connor (left) dons the green jacket as he accepts the Division 1 trophy from Lewis ‘Woody’ Underwood (right) at the Tahitian Queen rock ‘n’ roll bar on Friday, Oct. 16. 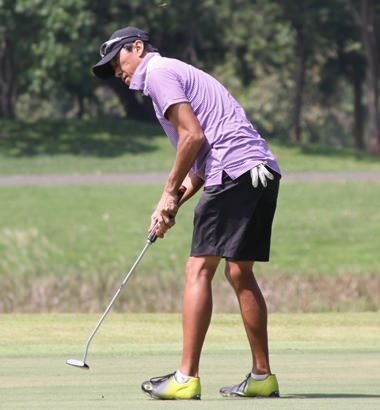 For a full report on the 22nd annual TQ Masters golf tournament. There was a wee bit of rain earlier in the day but it stayed mostly dry until the end – even though it certainly looked threatening. At one point, a clap of thunder struck somewhere in the vicinity and the siren went off for everyone to get off the course. It seems no one did, though, and the marshals didn’t seem to care too much either way. The overcast skies kept temperatures nice and not too hot, although humid at times. 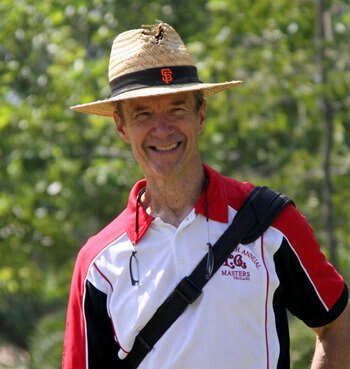 Relief from the humidity was fortunately at hand in the form of Bernie Tuppin, ‘Wild’ Bill Freeman and the TQ lovelies who rode around the course in the refreshment carts, handing out beer and water to packs of thirsty golfers. Division 2 winner Paul Ovens (left) receives his trophy from Woody. The Phoenix course was in fine shape for the tournament although the greens on the Ocean 9 seemed a bit slow, and some had been sanded. The Mountain 9 had a bit faster greens. Post golf, the players returned to the T.Q. bar on Beach Road for the traditional ox leg dinner provided by Bjarne of The Café Kronberg. With dinner out of the way, John Emerson produced his tallied list of the day’s scores and announced the winners as T.Q. ‘mine host’, Woody, handed out the prizes. 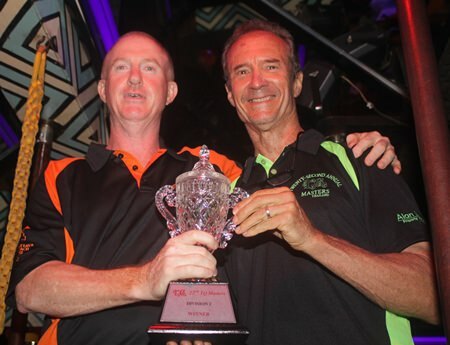 Woody (right) presents the Division 3 winner’s trophy to Nev Nicholson. The winner of Division 1 with a superb score of 40 points was Gene Conner, who finished two ahead of flight runner-up Brad Sproxton while two points further back in third place was Phil Smedley with an even par 36. Paul Ovens scored 39 points to take the Division 2 honours but only after edging a count back on the last six holes over Ian Pickley who returned a similar total overall. Third place in the flight went to Didier Chaumet just one point back on 38. Top spot in Division 3 went to Nev Nicholson with a well constructed 38 points and he was followed up the podium steps by Alan Raulton (37) and Matt Millar (36) respectively. So it was, that with his best score of the day 40 points, this year’s champion was declared to be Gene Conner and he strode up full of smiles to accept the green jacket from Woody. In the technical prizes, long drive awards went to Kurt Konier, Scott Cosban and Chris Oxley while the near pins were claimed by Gene Connor, Brad Sproxton, Paul Ovens, Darren Stanton, Paul Walph and Larry Deverdenne. A notable achievement on the day that received no prize was an albatross ‘2’ scored by Jose Garcia on the 493-yard par 5 Ocean #9 hole. 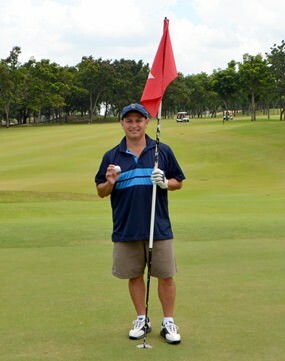 Jose has had 2 hole-in-ones before but this was his first ever ‘big bird’. Congratulations to him. 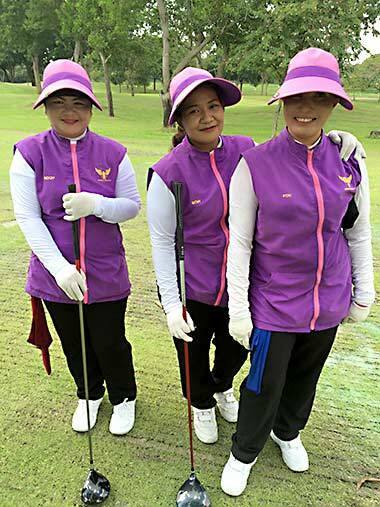 Phoenix caddies looking resplendent in purple. 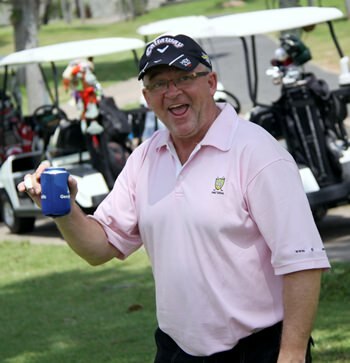 The final announcement was for the longest putt award, sponsored by Jack Levy from Macallen Insurance Brokers to the tune of 20,000 baht, with 10,000 baht going to the winner and the remainder to the Jesters Care for Kids. Larry Ball won and immediately and very generously donated his half back to the Jesters charity. The boss out on the course. Jose Garcia celebrates his ‘Albatross’ on the 493-yard par 5 Ocean No. 9 hole. A multi-coloured Dream Team with caddies. Green jacket winner Gene Connor sinks another putt. Larry Devereaux enjoys his day out. 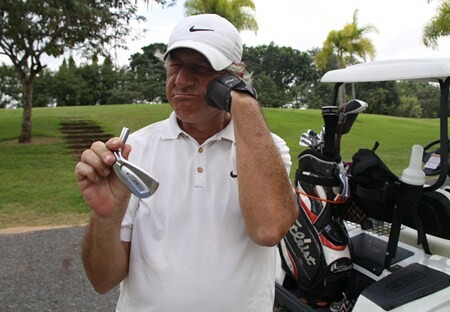 Didier Chaumet shows off his broken wedge.